A wide-ranging seed collection programme, mainly in Australia, has provided the NZDFI with a large, broad-based genetic resource with excellent potential for selecting elite trees for breeding. Since 2008, Proseed NZ Ltd (a tree seed company and NZDFI partner) has coordinated seed collection of selected eucalypt species within Australia and New Zealand. Collections have ranged across south eastern and southern Australia. Seed from some New Zealand E. globoidea trees has also been collected. We now have a large collection (over 500 families) of provenances and families from our selected species, providing genetic variability at a scale which gives great scope for genetic improvement. NZDFI is benefiting from world-leading research by Proseed into the development of rapid eucalypt propagation techniques. 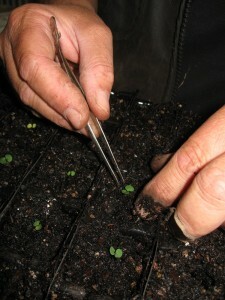 Tens of thousands of seedlings have been propagated from the seed collected by Morgans Road Nursery, near Blenheim in Marlborough. Individual trees from every family are carefully labelled so that every single tree can be tracked from the nursery to its planting site. This is an essential element of NZDFI tree-improvement programme.